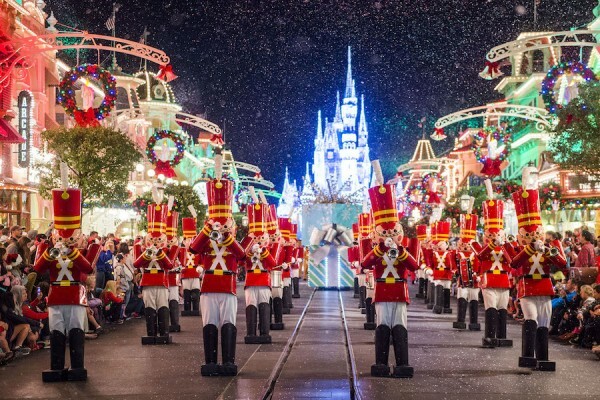 Halloween has come and gone and now the Magic Kingdom is ready to deck the halls and celebrate Mickey’s Very Merry Christmas Party starting on November 8. This year’s party kicks off with A Frozen Holiday Wish at the Castle Forecourt Stage starring Anna, Elsa, Olaf, and Kristoff. Elsa uses her powers to transform Cinderella Castle into an ice palace. 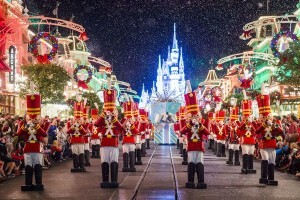 The party also includes Mickey’s Once Upon a Christmastime Parade with gingerbread men, elves, reindeer, Santa Claus, and Mickey Mouse and friends. New for the 2015 party is the a capella group VoicePlay at the Rockettower Plaza Stage in Tomorrowland. Also in Tomorrowland, Cosmic Ray’s Starlight Café is transformed into Club Tinsel during the party. Mickey’s Very Merry Christmas Party also features the Celebrate the Season show, cookies and hot chocolate, and of course the magical snowfall on Main Street U.S.A. The party is capped off with Holiday Wishes: Celebrate the Spirit of the Season. This year’s Mickey’s Very Merry Christmas Party starts November 8 and is held on select nights through December 18. A separate ticket is required for the party.